In a 45-minute speech, last night Theresa May outlined her plans/hopes for BREXIT which was tough enough to send European equities lower, led by the UK FTSE which fell 1.5%. There is a long and potentially torturous journey ahead in the negotiations between Britain and the EU. Hence a correction is hardly surprising after the 10% gains since early December by the UK's FTSE. 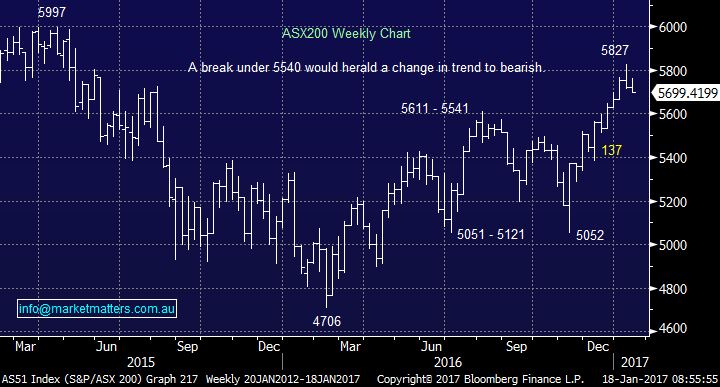 The ASX200 picked the negativity creeping into global equities perfectly yesterday falling almost 1% with no obvious lead. We held back from purchasing Henderson Group in our targeted sub $3.80 region simply because the market felt "wrong" and Theresa May's speech was likely to increase volatility. We are now short-term cautious as this correction unfolds - to date our selling strength in 2017 has worked perfectly now it's time to buy weakness when we feel it offers value and/or has simply become exhausted. Donald Trump, who is not yet President, has now started speaking in earnest, often via Twitter! He has just criticized a Republican corporate tax plan and stated the $US was too strong, citing currency manipulation from China as the cause - the market swings around his mood changes have begun. These comments were enough to send the greenback lower with the currency making fresh lows for 2017, down 3.5% from its highs of the year - as we have said recently a crowded trade is a dangerous trade. If Trump's comments can send the $US lower, it's not surprising that investors decided to lock in some profits in stocks after their enormous gains since his victory in November. The financials led the declines with the US KBW Bank Index falling ~3.5% at one stage - this may be good news for MM as we are looking to buy financials into weakness. Note we still like HGG and the strong reaction by the pound to Theresa May is a solid uplift to its earnings profile. 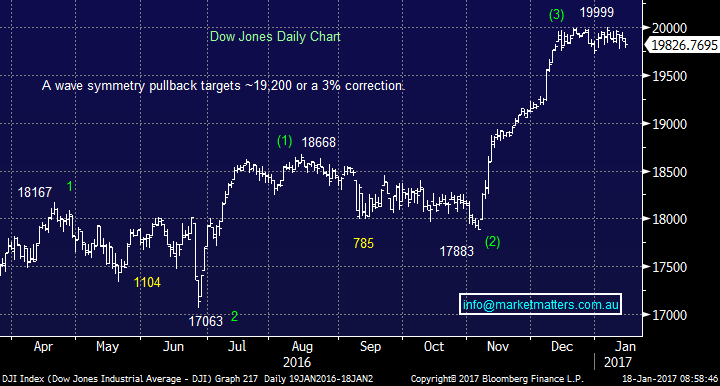 We are now mildly bearish the Dow short-term with a 19,200-target area. 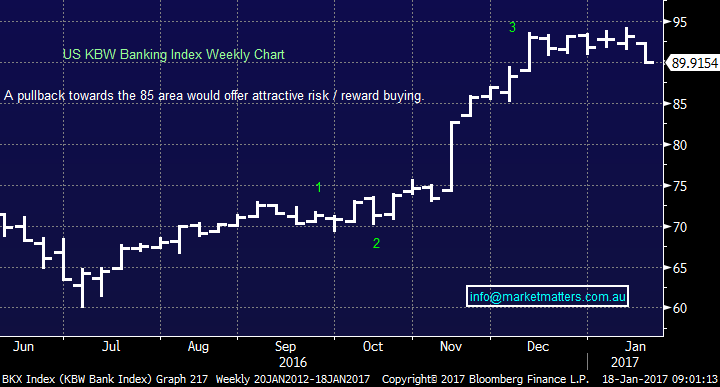 When we look specifically at the US Banking sector another 4% downside would not surprise but we would regard this as a buying opportunity. 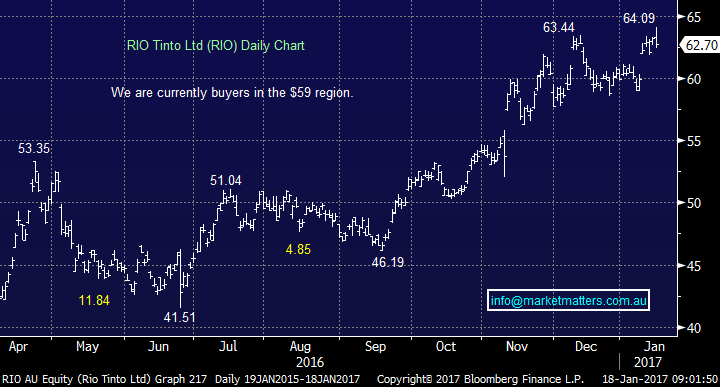 Both RIO and BHP satisfied our target for a break over 2016 highs yesterday enabling us to take profit on our RIO option trading position even though it failed to reach our $65 target (it traded to a high of $64.09) – another example of remaining open minded in this environment. We are now targeting a pullback to ~$59 (6%) in RIO where we will again consider a short-term / trading buy position. We feel a correction is unfolding in US equities that is likely to provide some solid opportunities in the domestic market - remember our theme for the start of the year, buy weakness and sell strength.